One situation almost all women dread is the possibility of balding. Things like hormonal changes brought on by age, pregnancy and genetics can cause a women to start balding. However, there are many other evils that could be making matters worse. If you are worried about balding, there are aspects that you can look at in you everyday life to help prevent it. Do you have a bad diet? A bad diet can affect your health and appearance in different ways including hair loss. A diet lacking in essential food groups can deprive your body from the nutrients necessary in the growth of healthy hair. A diet which includes all your vitamins and nutrients can be supported by supplements to reach your nutritional targets. 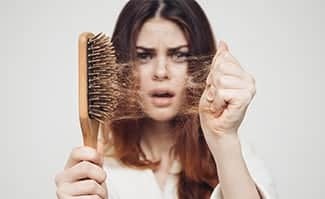 Protein, iron and vitamin A are especially important for hair growth and a deficiency in these vitamins is likely to lead to hair loss and balding or a lack of hair growth at the very least. Looking to add supplements to balance your nutritional needs and boost hair growth? Visit our online shop today. Balance is a very important concept when you consider your diet. Anything in excess can be damaging. In the case of hair growth and recovery, an excess of vitamin A can be counterproductive. Vitamin A is a prominent ingredient in most supplements that support hair growth and to a healthy and moist scalp which is the ideal environment for healthy hair growth. However, taking hair growth supplements with vitamin A as a way to speed up results without taking into account your lifestyle and the amount of vitamin A in your diet can lead to hair loss. Overdosing on vitamin A will not only hasten the growth of your hair but can also shorten the lifespan of your hair follicle unnaturally causing the hair to fall out. For advice on how to properly use vitamin A and other supplements to promote hair growth book an appointment with us today. An overactive thyroid, stress, anxiety and malnutrition can contribute to hair loss. Hyperthyroidism (thyroid disease caused by an over active thyroid gland) can cause weight loss and hair loss simultaneously. Other autoimmune disease like lupus can also lead to hair loss in the form of alopecia areata; where hair is lost in distinct patches and does not follow the normal pattern of balding. Losing weight intentionally through an extremely low-calorie diet or a diet lacking in essential nutrients can contribute to a vitamin deficiency and to hair loss later. A healthy body produces healthy hair. Taking care of your body with daily efforts to better nourish yourself can encourage healthy hair growth. Crown Clinic have specialised treatments for hair growth that are customised to fit the individual needs of each patient and give back their ability to grow strong healthy hair. Contact the Crown Clinic today and get advice on your choice of homeopathic supplements, medication and medicated hair products.